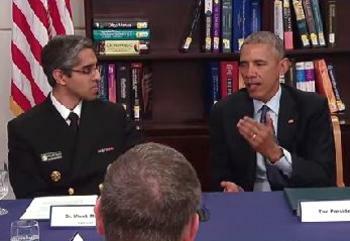 WASHINGTON, DC, April 10, 2015 (ENS) – “Climate change is having a impact on our public health,” said President Barack Obama on Tuesday after meeting with the new Surgeon General Dr. Vivek Murthy, EPA Administrator Gina McCarthy, and public health activists. President Obama declared this week, April 6-12, 2015, to be National Public Health Week and used the declaration as an opportunity to focus on how the warming climate will affect public health. A greater number of wildfires will fill the air with particulates; the allergy season will be lengthened; and insect-borne diseases that are not traditional to North America will start moving up from the south, health officials agreed. “There are a whole host of public health impacts that are going to hit home. And the great thing about this conversation is to see all the work that’s already being done by public health officials, the medical community, nurses and families to start raising awareness around these issues,” said the President. Obama announced that his administration is making publicly available more than 150 data sets on climate change in public health from agencies like the Centers for Disease Control and Prevention. Companies such as Google and Microsoft plan to use the data to generate apps and tools that can help communities educate and protect themselves, Obama explained. But the President is hopeful that the efforts of public health activists and organizations around the country will be able to start having an impact. “We have medical schools, including Howard, and public health schools pledging to train their students in the health impacts of climate change. And later this week, some of those educators will come to the White House to talk about how they’re incorporating climate change into their teachings, into their curriculum. And this spring, we’ll have a climate change and health summit at the White House,” Obama said. Surgeon General Murthy, a British-Indian American physician, was educated at Yale School of Medicine, Harvard College, Yale University and Yale School of Management. 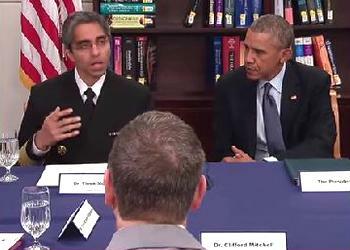 He wants to prevent public health problems, including those arising from climate change. “We know that climate change means higher temperatures overall, and it also means longer and hotter heat waves. We also know that higher temperatures can mean worse air in cities, and more smog and more ozone,” said Murthy. “We know that more intense wildfires will mean increased smoke in the air. And we know that earlier springs and longer summers mean longer allergy seasons,” he said. This is a personal issue for me because when I was young one of my favorite uncles – actually he was very dear to me as a child – he died from a severe asthma attack. And it’s also personal to me because I’ve cared for many patients over the years who have suffered from asthma and have seen firsthand how frightening it can be to suddenly be wheezing and fighting for every breath. Asthma can be very difficult for patients, but also for their families. And the impacts of climate change could make this situation worse. Murthy warned that longer summers and hotter heat waves will expose more Americans to heat stroke and to heat stress, especially those who work in outdoor settings in industries like farming and construction. Elderly Americans will be even more vulnerable to respiratory distress and possible death from extreme heat, he said a problem that we already experience in our cities, particularly among the poor and minority populations who don’t always have easy access to air conditioning. 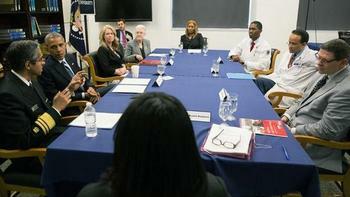 President Obama connected the increased number of asthma attacks to increasing health care costs that could be avoided. “Even if the child has insurance, it is still resources that are being devoted to treating a child that could have avoided an emergency room visit if we took better care of the environment in which they were growing up,” Obama said.